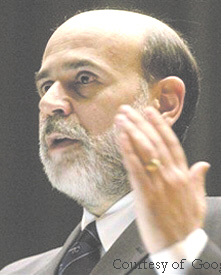 벤 버냉키(Bernanke) 미 연방준비제도이사회 의장. 지난 1일 취임 1주년을 맞은 그는, 투명성을 중시하는 전임자 앨런 그린스펀의 정책 방향을 유지하며 비교적 무난한 1년을 보냈다는 평가다. 취임 초 CNBC 기자와의 대화내용이 그대로 방송을 타며 한바탕 곤욕을 치르기도 했지만, 학자 출신다운 솔직함으로 그린스펀과는 다른 자신만의 리더십을 구축해가고 있다. ●There is enormous demand for dollar denominated assets so I don’t expect that this demand would drop precipitously. 달러화 자산에 대한 수요는 여전히 엄청나다. 이러한 수요가 사그라지지 않을 것으로 본다. ●The greatest single cause of the fiscal surplus of the 1990s was the stock market bubble, which led to an unsustainably high level of economic activity and tax revenues. 지난 1990년대 재정흑자의 주춧돌은 주식시장의 거품이었다. 높은 수준의 경제 활동, 그리고 세수증대는 모두 이 덕분이었다. ●I see inflation as remaining well-contained going forward. 인플레이션은 지금까지 잘 억제돼 왔고, 앞으로도 그럴 것이다. ●Those high oil prices are a burden on U.S. families, on firms’ production costs. But the good news is that at least so far the U.S. economy has not been slowed by the high energy prices. 유가가 고공비행을 하며 미국 가계, 그리고 기업의 생산비에도 주름살을 드리우고 있다. 하지만 현재까지 미국경제는 고유가로 성장세가 꺾이고 있지는 않다. ●My first priority will be to maintain continuing with the policy and policy strategies under the Greenspan era. 내가 가장 역점을 두고 있는 점은, 그린스펀 시절에 입안된 정책의 일관성을 유지하는 일이다. ●Under Chairman Greenspan, monetary policy has become increasingly transparent to the public and the financial markets, a trend that I strongly support. 그린스펀 의장은 통화 정책의 투명성을 꾸준히 높여왔다. 나는 이러한 흐름을 지지한다.